Esterillos Oeste , Esterillos – Announcing a price drop on NATURE UTOPIA, 2 stunning acres, pool, Natural Retreat, a 2,690 sq. ft., 3 bath, 3 bdrm 2 story. Now $475,000. JUST REDUCED 100K ! • 2,690 sq. ft., 3 bath, 3 bdrm 2 story – $475,000. JUST REDUCED 100K ! Esterillos Oeste , Esterillos – This beautiful Costa Rica property for sale in Esterillos Oeste, Costa Rica is one of the most impressive new listings in my inventory. This property perfectly captures the natural splendor of the area and is crowned with a spacious, beautiful, luxury home; there is also a small guest house! The main home is perfectly situated on 2 acres of lush green landscape ringed with native trees such as orange, guayaba, banana, mandarin, lime. Enjoy picture perfect flora and fauna, two creeks, as well as backing up to hundreds of hectares of Costa Rican jungle. 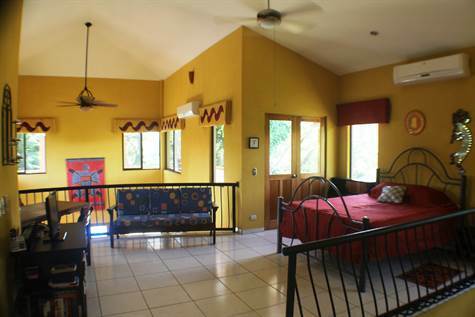 This property is like your own exotic personal nature reserve with tropical animal corridor featuring monkeys, butterflies, an AMAZING array of Tropical Birds, yet, property is only 800 meters to the beach! If you are looking for privacy and tranquility yet don’t want to be “out in the boonies”, look no further. The home itself was completed in 2009, designed, built, and supervised to North American standards. This is a 250 meter (2690 sq feet) incredibly sturdy home with two levels and walls of steel reinforced concrete block with beautiful Costa Rican cedar doors and frames, polarized windows, highest quality Spanish clay tile roof and iron work, balconies and porches, ceiling fans and a huge two car garage with plenty of storage. This home was built and maintained with a lot of TLC, attention to detail and practicality, and it shows! There is a back up water system and pump, AC units in every room, a fully equipped kitchen withstove, fridge, pantry. This is an incredible amenity. What makes the POOL Distinctive? Great for “Open-Window Living” with Ocean and Mountain Breezes as “Nature’s Fans” plus 5 Interior and 4 Exterior Fans or as “Closed-Window Living” with – 4 Air Conditioner Units providing ‘great cooling’. This property is being sold with everything! It is turnkey and ready to be enjoyed immediately. There is also a very impressive supply of tools, power washer and other garage items that are included. Call me or write for more information and to schedule a showing.